NLP Mirroring is an alternative to NLP Matching and it involves mirroring someones movements in order to gain rapport with them. Imagine you are looking in a mirror. If they raise their left hand slightly, you raise your right hand. Breathing is the single most important component of physiology to work with when matching and mirroring because it is unconscious in the other person and the easiest to notice. Watch the shoulders, the chest, the stomach. Shoulders are your best bet, especially when observing a female! 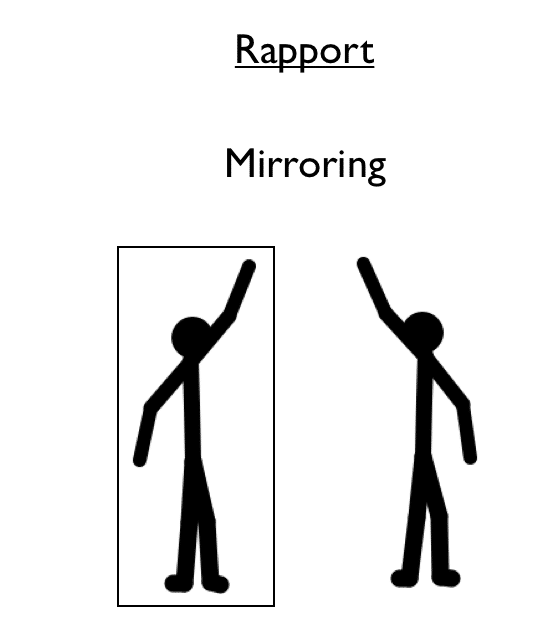 Mirroring is part of the NLP subject of Building Rapport. For a comprehensive guide on how to get in rapport consistently and at will, we have video and audio training series available via our NLP e-Learning section of this website, which we run in addition to our live NLP training courses.